It’s time for the SUO162 “Holiday Cuteness” Challenge atSU-Only Challenges! 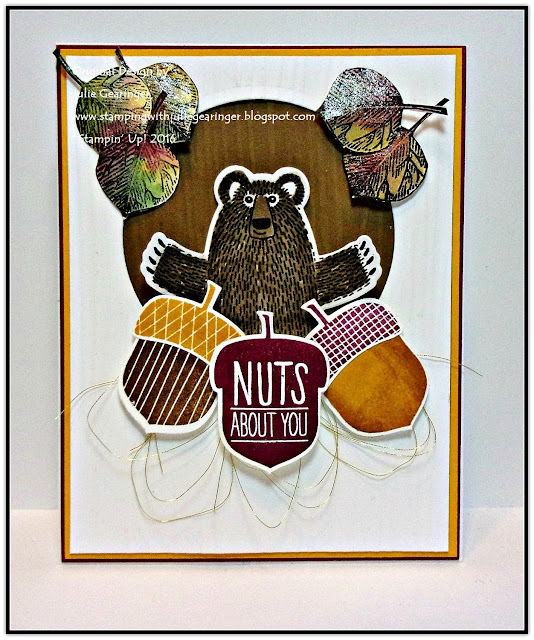 I decided to create a fun card for fall using Bear Hugs, Acorny Thank You and Vintage Leaves. I am also linking to the final Tic-Tac-Toe #22 Challenge- so sad to see this challenge site end and wish all of the Design Team members well! They have inspired us so with their creations :-) I chose the diagonal Scene, Use Dimension and Texture. I hope you will stop by the SU-Only Challenge site to check out the rest of the Design Team projects as well as the other challenge galleries- fabulous inspiration from all! Ink the Bear Hugs large bear with Basic Black Archival Ink, stamp onto a piece of Whisper White cardstock and heat set with the Heat Tool. Using the Stampin’ Write Soft Suede Marker with the AquaPainter™ to watercolor the image and die cut with the coordinating Bear Hugs Framelits™. Use the Big Shot™ with the Woodgrain Textured Impressions™ Embossing Folder to emboss a scrap piece of Soft Suede cardstock as well as a piece of Whisper White cardstock, trim the Whisper White panel to approx. 4’ x 5 ¼”, mount onto a piece of Hello Honey cardstock, trim and mount onto the Rich Razzleberry card base. Ink the acorn images from Acorny Thank You with Rich Razzleberry, Hello Honey and Soft Suede Classic Ink, stamp onto Whisper White cardstock and punch out with the coordinating Acorny Thanks Builder Punch. Ink the leaf images from Vintage Leaves with with Basic Black Archival Ink, stamp onto a piece of Whisper White cardstock and heat set with the Heat Tool. Color the leaves with Hello Honey, Garden Green and Soft Suede Classic Ink along with an AquaPainter™, dry with the Heat Tool and fussy cut the images. Tuck the bear image into the circle, add the Gold Metallic Thread loops before layering the acorns around the front bottom edge with Stampin’ Dimensionals®. Tuck the leaves into the circle as well as adding additional leaves to the top corners of the circle with Stampin’ Dimensionals® , apply Clear Wink of Stella® to the leaves to finish off the card. I hope this card has inspired you to pull out your Stampin’ Up! products and join us in the SU-Only “Holiday Cuteness” Challenge. Thanks again for stopping by- hugs and have a great week! This is so cute!! I LOVE the fun little bear you chose to use!! Thank you for playing with us at Stamping Smiles Designs Tic-Tac-Toe Challenge!! This card is adorable! Love the beautiful colors you've chosen. Thanks for joining us at the Tic-Tac-Toe Challenge!